I am using the Gatk v3.1 UnifiedGenotyper for variant calling of some GBS type data in the plant genus Boechera. I have diploids as well as triploids, where I have the ploidy from a prior microsat run. The diploids work out well (I get some 150k variable loci), but I can't seem to get variants for the triploids. I was able to call the triploids with the diploid option, but - obviously - this is not what I want. I additionally ran the following relaxed stringency options. None of them return any variants. Additionally, I attached the slurm log file for the last mentioned run. I am at a complete loss, what am I missing here? I finally figured it out! When aligning with bwa, I used the "-I" flag (bwa manual: "The input is in the Illumina 1.3+ read format (quality equals ASCII-64)"). I was not aware of the fact that Illumina had switched back and forth between asci-64 and the Sanger format for reporting the phred base qualities (the "+" can be slightly misleading). By using -I, the base qualities shifted downwards (thus the negative phred base qualities) and only the variants with very high qualities were used in GATK. UnifiedGenotyper just finished for both diploids and triploids, and I have 510k (vs 146k with -I in bwa) and 438k (vs 0) variants, respectively. HaplotypeCaller is still running, but now I'm pretty confident that it'll spit out a bunch of variants. I apologize for bothering you with this, although I probably wouldn't have found the solution without your help. Are you able to get variant calls if you get rid of all the non-required parameters except ploidy? Also, have you tried the latest version, 3.5? You should really try doing this with HaplotypeCaller in the new version. UG is deprecated at this point. ok, tried the same wth v3.5, with the same results. Will give the HaplotypeCaller a try. I tried to run the HaplotypeCaller (v3.5), without success. I tried a second run with the triploid individuals and -ploidy 3, without success. 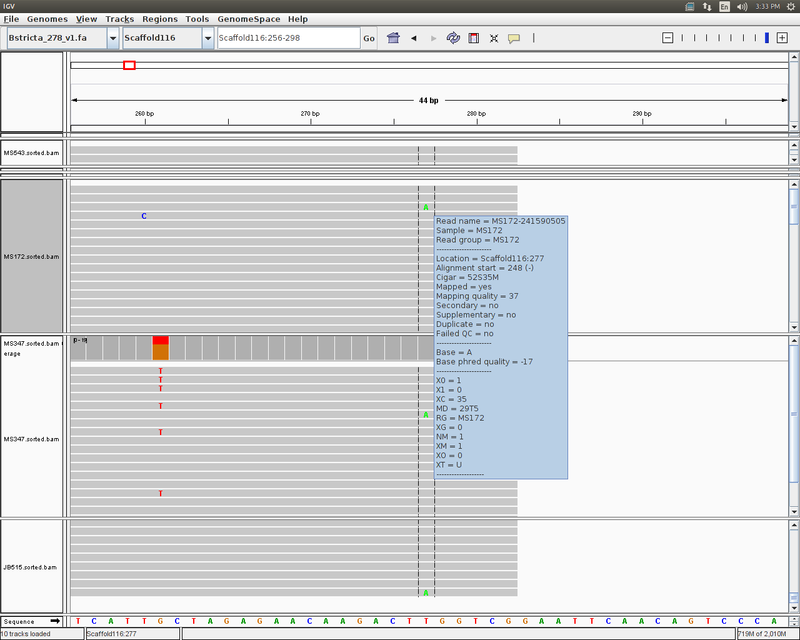 With the UnifiedGenotyper, at least my diploids produced SNVs. Now, none of them seem to work. Can you post some IGV screenshots of the sites called in your triploids as diploids with UG? Do they look reasonable? And can you run HC in debug mode on those same sites? See this article for instructions on how to debug HC calls. See also this article for general recommendations dealing with failure to call expected sites. Scaffold116 277 . T A 30.60 LowQual AC=3;AF=0.056;AN=54;DP=1354;Dels=0.00;FS=0.000;HaplotypeScore=0.0459;InbreedingCoeff=-0.1422;MLEAC=3;MLEAF=0.056;MQ=37.00;MQ0=0;QD=0.20 GT:AD:DP:GQ:PL 0/0:40,0:40:9:0,9,120 0/0:24,0:24:3:0,3,40 0/0:24,0:24:12:0,12,160 0/0:83,0:83:15:0,15,200 ./. 0/0:107,0:107:18:0,18,240 0/1:71,1:72:28:28,0,108 ./. 0/0:8,0:8:6:0,6,80 0/0:94,0:94:18:0,18,240 0/0:135,0:135:39:0,39,520 ./. ./. ./. ./. ./. ./.:. :13 ./. 0/0:33,0:33:6:0,6,80 0/1:62,1:63:28:28,0,108 0/0:59,0:59:18:0,18,240 0/0:38,0:38:6:0,6,80 ./. 0/0:67,0:67:9:0,9,120 0/0:15,0:15:3:0,3,40 ./. 0/1:18,1:19:34:34,0,34 ./. ./. ./. 0/0:12,0:12:3:0,3,40 0/0:1,0:1:3:0,3,40 0/0:28,0:28:6:0,6,80 0/0:42,0:42:9:0,9,120 0/0:23,0:23:15:0,15,200 0/0:16,0:16:9:0,9,120 ./. ./. 0/0:127,0:127:27:0,27,360 ./. ./.:. :22 ./. 0/0:16,0:16:3:0,3,40 0/0:45,0:45:9:0,9,120 0/0:18,0:18:6:0,6,80 0/0:2,0:2:3:0,3,40 ./. I noticed that igv gives base qualities for the two variants as -17 and -4, respectively. Negative phred scaled base qualities do not make sense to me, how come I get those? So, you used Illumina to sequence your samples? Illumina should not be giving those negative base quality scores. Can you tell us how exactly you processed your files after you got them from the sequencer? Did you follow the Best Practices? 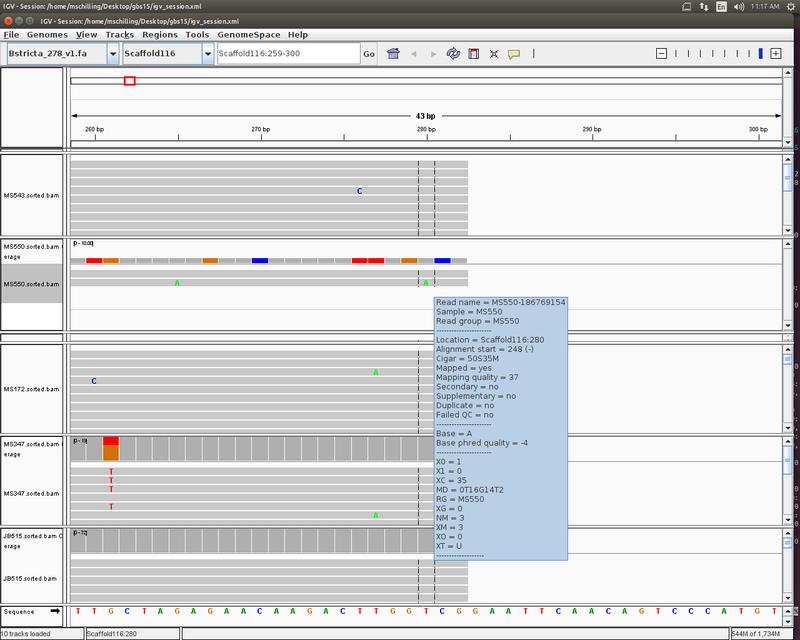 After initial parsing of barcodes (GBS data) and splitting individuals into separate files, the reads were aligned to the JGI Boechera stricta assembly using bwa samse and then converted to bam using samtools. Unfortunately, I'm not sure we can help you out much here. We don't support GBS data, but can you make sure your bam files are valid? You can use Picard's ValidateSamFile. As for the VCF not containing any variant calls, it looks like most of the sites don't have enough evidence for a variant call. The few samples that do get called variant show maybe 1 read with a variant allele out of all the reads. That is really not enough evidence to have confidence in the variant call.